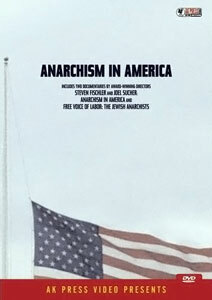 Anarchism in America is a 1983 documentary, directed by Steven Fischler and Joel Sucher, and produced by Pacific Street Films. It has been re-released by AK Press to DVD. The film begins by explaining the filmmakers' interest in anarchism based on their involvement in the group Transcendental Students while in film school at NYU. The film includes interviews with influential anarchists Murray Bookchin, Paul Avrich, Jello Biafra, Mollie Steimer and Karl Hess, and with poet Kenneth Rexroth. It also discusses the Spanish Civil War, the 1917 Revolution, the influence of Emma Goldman and the case of executed anarchists Sacco and Vanzetti. The film labels anarchism as the only ideology that is staunchly anti-authoritarian, and discusses how anarchist ideals align with the revolutionary, independent spirit of America from rural communities to urban zones.